Learn how dying in Sekiro affects the game, how to avoid true death, how resurrection functions, and the effects of Dragonrot and Unseen Aid. Dying and resurrecting are two main mechanics in Sekiro: Shadows Die Twice. The threat of death lingers around every corner, and although you might be able to resurrect to fight again, the penalties of dying a true death are high. Understanding these mechanics early on is going to save a lot of pain and anguish down the line. To break death down into its most simple form, Wolf will die once his vitality is at zero, as represented by the health bar. At this point, he will fall to the ground and you will either load in at the most recent Sculptor’s Idol or be able to resurrect. Without being too reductive, avoiding death means avoiding taking damage. To do this requires using the various dodge mechanics or the deflect system – be careful, as Posture is just as important as vitality. Items like the Healing Gourd and Medicinal Pellets will restore health, helping you stay in the fight for longer. These items are both rare and difficult to upgrade, so use them wisely. Check out our Gourd Seed locations guide to help you upgrade your Healing Gourd. 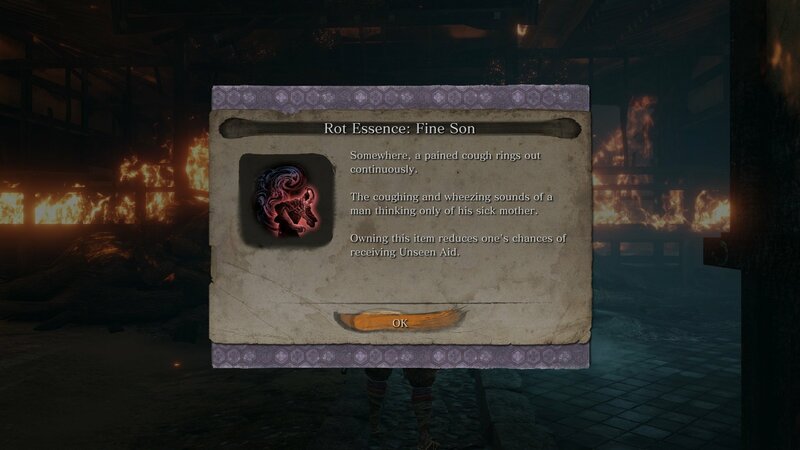 The resurrection ability is unlocked the first time you die in Sekiro after meeting the Sculptor. According to the story, this ability is made possible thanks to one character giving Wolf some of their blood. Once the resurrection ability is unlocked, you will be able to use it to revive and continue fighting. 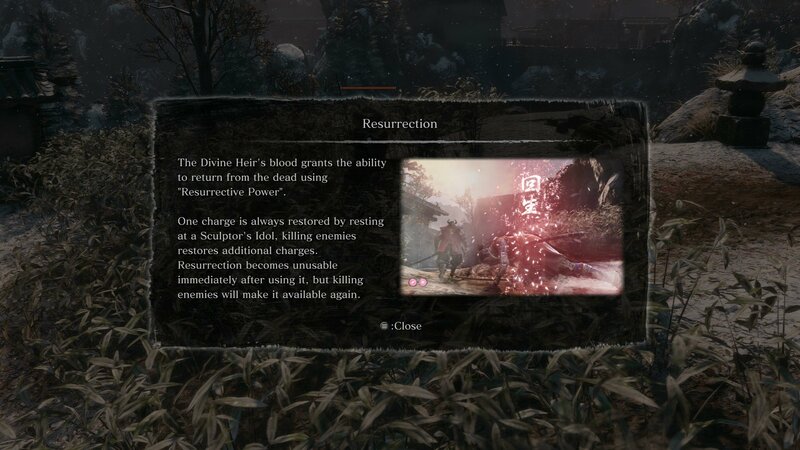 A single resurrection charge is restored after resting at a Sculptor’s Idol, with more charges earned by killing enemies. Death isn’t always the end in Sekiro. In fact, the whole premise is about being able to come back to life to fight again. This resurrection mechanic allows you to get back up after taking critical vitality damage. However, this ability is only available under certain conditions. In order to resurrect, you must have at least one resurrection charge. These are represented on-screen by a purple-pink circle above the vitality. After resurrecting, any extra charges you have will be blacked out and unavailable for use. To be able to use another resurrection charge, you will need to kill an enemy. Much like the other Soulsborne titles, death in Sekiro: Shadows Die Twice has its own penalties. However, players are given the chance to cheat death using the resurrection mechanic. In the event your resurrections are unavailable, if you have none or they are blacked out, and you die, you will face a true death. 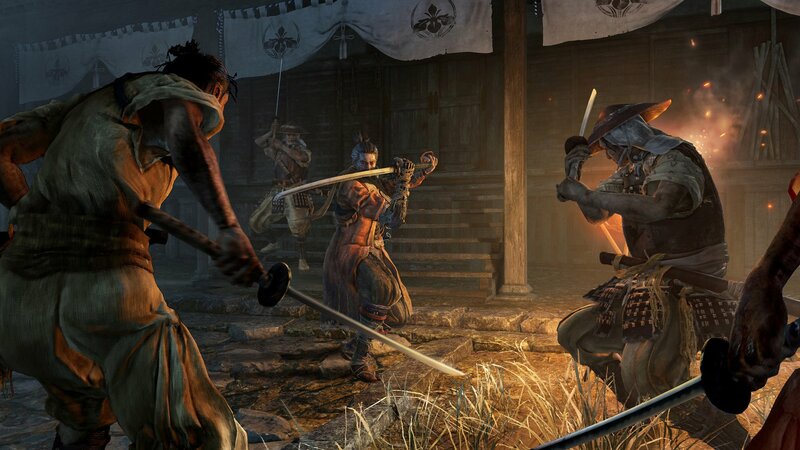 True death in Sekiro is as disastrous as, if not more than, dying in Dark Souls and Bloodborne. If you die a true death, you will lose half of your sen and half of your experience. This more sen you have, and the closer you are to another skill point, the more you want to avoid dying or engaging in difficult combat. Dying will not lose you skill points. If you are saving for an expensive skill or ability and have 2 or more skill points in the counter and happen to die a true death, you will not lose any of those points. Because of how this works, if you are getting close to earning another skill point, considering spending some time grinding to unlock another point before you tackle a boss fight or hard area. The other penalty for dying a true death is something called Dragonrot. 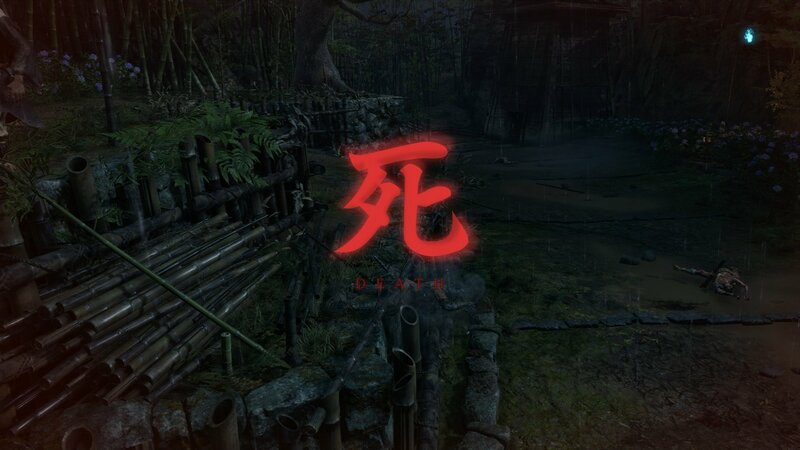 Dying too much in Sekiro: Shadows Die Twice results in a disease called Dragonrot. This sickness afflicts all those who you come in contact with. Though NPCs that are infected with Dragonrot will not die, their questlines will not continue further. Whenever you come into contact with someone with Dragonrot, you will receive a Rot Essence. This will sit in your inventory and will decrease your Unseen Aid by set amounts. Unseen Aid is a blessing that has the chance to help you when dying a true death. 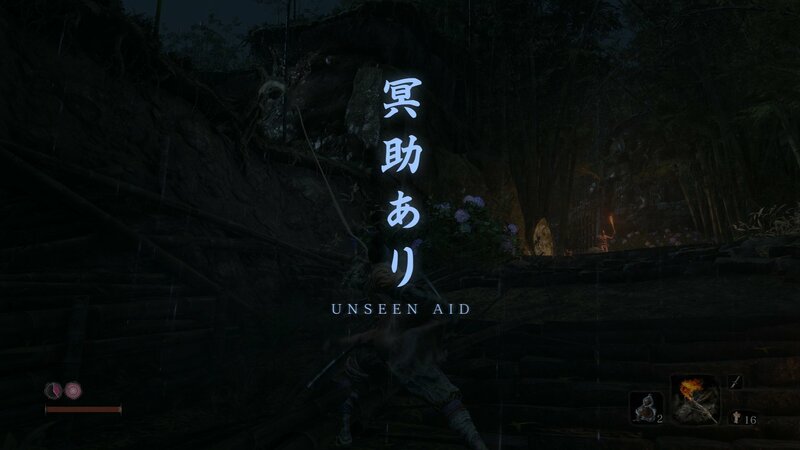 If the Unseen Aid blessing activates, you will not lose any sen or experience. The chance of this effect happening is displayed as a percentage in the pause menu. As mentioned above, this percentage will decrease with every bit of Rot Essence you have in your inventory. The first Rot Essence halves Unseen Aid and a further 2% is lost for each subsequent Rot collected. There is a way to remove Rot Essence and heal those affected by Dragonrot. After finding a Dragon’s Blood Droplet, offer it to the Sculptor’s Idol to heal those who are ill and remove the Rot Essence. This will bring the Unseen Aid back up to 30%, which improves the likelihood you will not lose any sen of experience on true death. Visit someone who has been infected with Dragonrot and speak with them again to take a sample. My merchant at Outskirts Wall – Stairway Sculptor’s Idol became sick, and I was able to collect a sample from him. You may be able to collect a sample from the ill mother or her wounded son. With the sample in hand, return to Emma and give her the blood, she will get back to you later on with the findings of her research. The various death-related mechanics in Sekiro: Shadows Die Twice are complex and deeply intertwined. It’s important to study and understand how dying and resurrection works as well as the ramifications of true death and the Dragonrot illness. Be sure to check out Shacknews’ Sekiro: Shadows Die Twice page for more helpful guides.